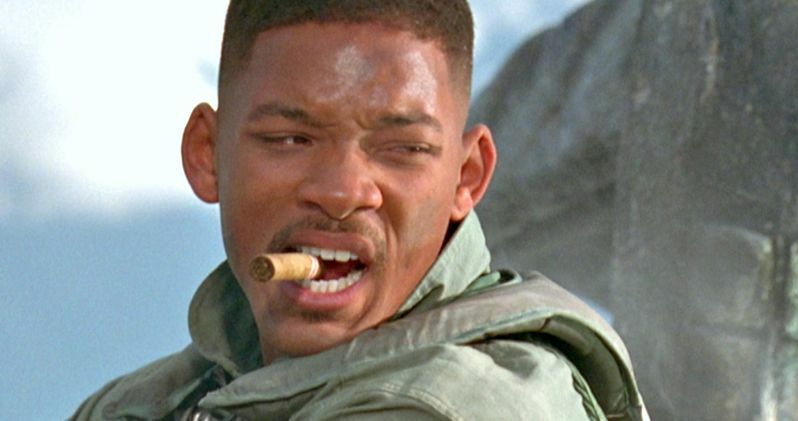 What Does Will Smith Think About His Independence Day Character's Fate? This summer, Independence Day celebrates its 20th anniversary, the film that helped solidify Will Smith's status as a bona fide box office star. The anniversary celebration will be coupled with the release of the long-awaited sequel, Independence Day: Resurgence, which hits theaters on June 24. While several characters come back for the follow-up, Will Smith's Stephen Hiller will not be one of them. The filmmakers have killed off his character in an off-screen plane crash. During an interview with Yahoo! Movies, the actor revealed his reaction to the news that his character was officially dead. "I was working on Suicide Squad during that time. [Independence Day director] Roland [Emmerich] and I had talked about it. The trailer looks really cool. I'm going to be sitting around with tears in my eyes when that one comes out... It was terrible when I found out my character died." The news of the death of Will Smith's Stephen Hiller was revealed through a news report on a viral website. The report revealed that he died while test piloting the ESD's first alien hybrid fighter, when an unknown malfunction caused the untimely death of Col. Hiller. It isn't known if his death will be addressed in the actual film or not. With seven months until the film's release, we'll have to wait and see if this death is touched upon even more in future trailers. Vivica A. Fox returns to reprise her role as ex-stripper Jasmine in Independence Day: Resurgence. And Jessie Usher takes over the Will Smith role as son Dylan Hiller. We got our first look at Dylan in yesterday's teaser. It also brought our first look at new cast members Liam Hemsworth and Maika Monroe. They will be fighting this alien attack alongside returning cast members Bill Pullman and Jeff Goldblum. When Independence Day: Resurgence begins, we will learn that a small squad of Alien resistance fighters still survive in an isolated area of the African Congo. Though, the majority of the alien threat has been neutralized around the world. Earth has risen from the ashes. And a grand reconstruction has started as the great cities, monuments and landmarks of the world are slowly restored to their former glory. It is now twenty years after that initial attack. And the aliens are coming back ready for revenge. Related: Will Independence Day 2 Destroy Finding Dory at the Box Office? The near annihilation of humankind has given the world an unexpected but welcome effect as centuries old conflicts and political distrust are dissolved to create an unprecedented unity among the nations of the world. Following the newly established global peace alliance, the United Nations creates the Earth Space Defense program (ESD) to serve as an early warning system and united global defense unit. War of 96 hero David Levinson has been appointed as its Director. In conjunction with this announcement, the ESD launched a worldwide publicity and recruitment campaign. What do you think about this news? Why Did Independence Day 2 Spare This Landmark?